My garden is coming along, albeit slowly. Most of you probably remember from last year that our garden area is impossibly rocky. So it isn't the friendliest soil for gardening. I had hoped to get a load of compost to add to it before I got started, but for whatever reason my husband wasn't thrilled with the idea, so I just forged ahead with the planting. This is the first year for this patch of rhubarb, so I'm not taking much from it. I did snag enough for a tasty rhubarb crisp. The last time we went to the Booker T. Washington National Monument, they were giving away started seeds from their heirloom garden. So I picked up a few cantaloupe. And also grabbed some free dill, which you see in the foreground. To the back left is a tomato, and the back right corner is garlic, followed by asparagus. 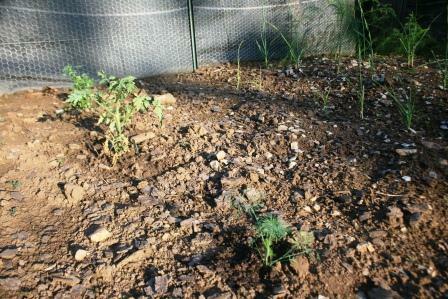 This is the asparagus's first year, so sadly there won't be a harvest. But I have high hopes for next year. Some of the lettuce that survived a surprise attack by the twins. They destroyed most of my lettuce seeds, but I've got a few patches growing. The problem? I've never grown lettuce before, so I'm not sure when to harvest. This kind of looks ready to eat? On a side note of delighted discoveries, a couple of our hens have started laying each day in an empty flower pot on the front porch. Talk about making for easy egg gathering! What about you, readers? What's growing in your yard/garden/flower pots? Also, I'm asking for any suggestions for squash bugs. We seem to be overrun with them this year, and I don't like using Sevin if I don't have to. It's Rural Thursday! That means you can link up with others any posts that fit in with a rural mindset (nope, you don't actually have to be rural to join in). Copy the code below the button and paste it into your blog post. Then come back and add your link to the linky. Please make sure to visit the posts of 5 other participants and leave them some comment love. As always, can't wait to read your contributions! Your garden is looking very good this year. We both got a HUGE laugh at the last picture and caption!!!! TOO funny!!!! Well, your garden is a lot better than mine because I don't have one! My daughter did want to grow some green onions, though, so we planted those in a big pot and they're coming along nicely. I loved looking at the pictures of your garden! We had a big vegetable garden at my parent's house last summer, but since we're spending this summer at our apartment in Japan we only have a balcony garden...and so far that's just flowers. Our sunflowers are doing really well though (even though I almost didn't get them because I was certain they wouldn't grow), so that's exciting! And as for the eggs in the porch pots: perfection! I look forward to your linky party every week. I enjoy your posts, as well as reading what others are doing in their "rural" world. Thanks so much for hosting. Your garden looks like it is coming along nicely. I have not even planted a garden yet. I have no idea where all the time has gone. I may be supporting my local farmers and their roadside stands this year for veggies if I do not get planting. Holy crow! I thought my soil was rocky! What I've been doing for the last 2 years is scraping off the top layer of rocks with a metal garden rake and adding them to the drive way. I do this a couple of times during the summer. Then when we till in the fall I rake a couple more times. I figure after a couple of years of rock combing and fertalizer adding I should have a pretty fruitfull garden. Now to get someone to stop throwing their banana peels in it! Hope you don't mind. I added an old post to this. Your garden is looking great and the lettuce looks ready to eat by me. We have striped cucumber beetles that have decided to move into my winter squash patch. Last year I had the same problem. I have been putting diotomacious earth on the leaves, and this seems to be helping - because we aren't completely overrun with them as we have been in the past. However, I am also going out and checking the leaves every day, and then when I see one, I pick it off and squish it with my fingers. 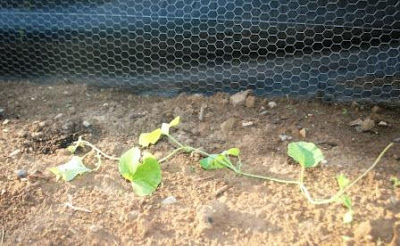 I have no ick factor with cloth diapers, but bugs seem to bother me, but after they killed every squash/winter squash/cucumber plant I had last year, I am getting over ick :-) Good luck! You should grow grapes. They love rocky soil like that. Try spraying those squash with dawn dish soap mixed with water. You have to respray every time it rains. 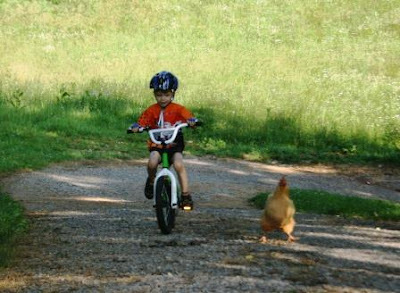 Love that picture of The Chicken in Peril! Your garden looks amazing! I love the chicken chase! Well your garden looks awesome, and your kids are just adorable. What a wonderful setting for them to grow up in. Look forward to getting to know you and following your blog! Your garden looks wonderful!!! Makes me miss home. I haven't had any garden time yet! So who won? The kid or the chicken? 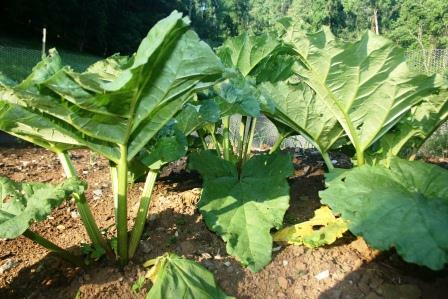 You will love your rhubarb and asparagus next year! Squash bugs? I hate those things! Unfortunately, by the time I discover them, it's way too late. Good luck! The plants look healthy! Homegrown veggies are sooooo good. We have not planted a thing. We have talked about putting in a platform gardening area if my husband can find the right kind of wood to build it with. I want to go ahead and do it this summer and even if I don't get any fall crops planted, I can try to work on the soil for next spring. We'll see . . .
Our soil was super rocky too! My husband and I have been saving our compost for about 2 years now to try and make the soil better. I think it's finally starting to work. Our strawberries are awesome this year! Our garden is growing slowly too but after last summer's wet spring conditions this year looks good so far. I'd harvest the lettuce if the outer leaves are around four inches. Training your chickens to bring the eggs to the door is just perfect! :) So funny that they did that. Your run, chicken, run made me smile! Your garden is way better than mine this year. With all the kidding issues, I doubt I even get to have a real garden. :-( That is a nice convenient place for the girls to lay eggs. we're overrun with grasshoppers here, so i'm glad i have nothing in a garden. they ate my yarrow flowers to stalks. What a considerate hen you have, to lay her eggs in such a convenient place. I've never heard of anyone calling beets beloved before! I love rhubarb, but I've hardly had the chance to eat it since becoming an adult. I'm the only one in my family that likes it. your garden is looking great. love that you got heirloom seeds from booker t! the only thing i have growing is basil....lame i know! oh and i love that shot of the chicken race! 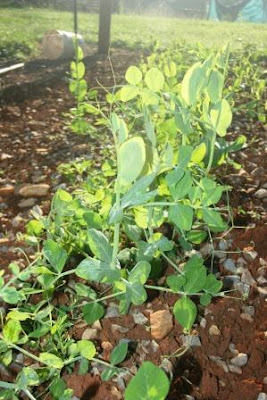 We just ate peas straight from the vine yesterday. Also growing is - beans, tomatoes, eggplant, cucumbers, kale, cauliflower, zuc, butternut sq., yellow sq, and the list goes on. We set up new garden this year too and are struggling a lot with it. We'll see what comes out of it in the end but I think you can't really go wrong, even with a bad garden! Your chickens made me LOL!! How nice of them!! We're finally able to get things into the ground now, but there's still a huge chance of frost and freezing weather ahead...and I'm battling varmints bent on devouring my seedlings...grrrrrr! 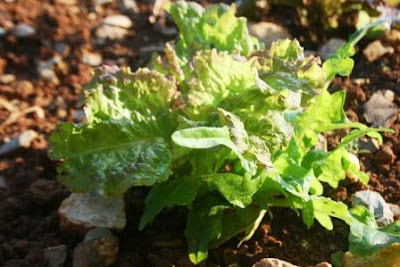 I'm not sure about the time to pick lettuce, but I would be so tempted to do it now when it is tender! 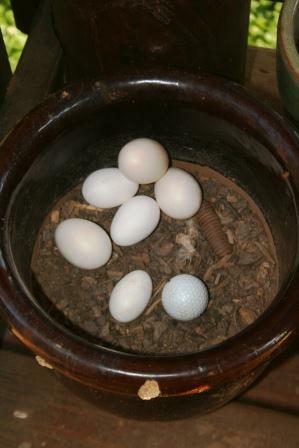 What thoughtful hens to lay eggs right in your flower pot! I am growing a tomato, but no pics yet. It's just started flowering so I'm super stoked! Your garden looks like it's coming along pretty well. My patio pots are not doing too much. Only my cucumbers seem to be growing. How funny that the hens are laying eggs in the pot. We have had good luck with Neem Oil for the squash bugs and I believe it is a natural pesticide. That last picture cracks me up!! Your garden is doing great! We do not have squash bugs but we have slugs and they are thick this year! The comment about taking the lettuce leaves underneath first is what I do. 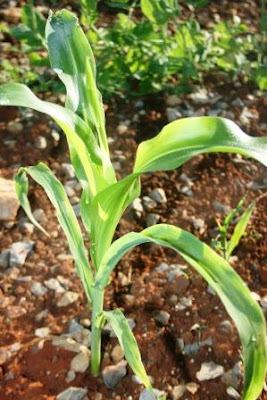 When it starts to bolt, I usually break off the stalk before it grows up. I had big trouble with squash bugs last year. They destroyed much of my vine plants. I did read that you could use a piece of duct tape to remove the eggs which are usually laid underneath the leaves. 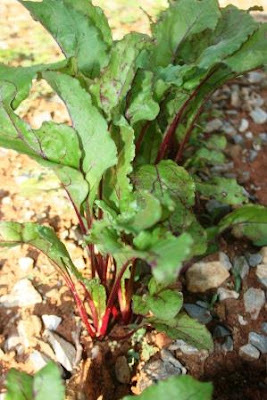 I also love beets.... Hope you get some great veggies from your garden. We have lots of flowerpots around our yard --but no EGGS in them... Dang it!!!!! Lovely little garden. :) We hope to have a garden one day. Love the last pic! Very cute! I love how the hens are laying right at your door! What a great idea for a blog hop. I've added both your blog button and your hop button to my pages as well as on the post that I linked up. You've inspired me to write a post about my garden too. So, I'll have something to link up next time. Have a great day and happy gardening (farming)! oh my! I'd say your garden is a little rocky. I feel for you! This is our first year of lettuce too. We grew butter crunch and I cut it at about 5" tall. I heard if you let it go too long it will be bitter so I cut it when it felt right hahah. It was tender as can be. I don't have any suggestions for the squash bug other than keep them on your side of the mountain! We don't have them yet but we've been fighting voles for weeks now. UGH! ooohhhh i think the garen looks great!! i haven't planted a single thing this year, nothing, zip, nada!! yesterday i weeded, we sure did have a lot of weeds. why can't i get my crap to grow like that!! I don't have chickens any longer, but I did once have one of my hens lay an egg in my lap while I was holding her. Yes! I used to sit outside and hold my chickens just like one would a dog.